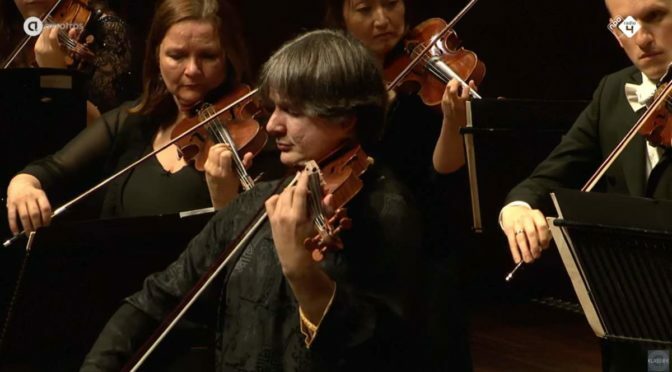 Accompanied by the Concertgebouw Kamerorkest (Concertgebouw Chamber Orchestra), Romanian violinist Liviu Prunaru performs Felix Mendelssohn’s Concerto for Violin and String Orchestra in D minor. Recorded at the TivoliVredenburg, Utrecht on October 28, 2016. Published by the AVROTROS Klassiek. Mendelssohn composed this piece from 1821 to 1823 while aged only 12 to 14. It was written for Eduard Rietz (eldest brother of Julius Rietz, the German composer, conductor and cellist), a beloved friend and teacher. The concerto was long forgotten before resurrected by the famous violinist Yehudi Menuhin in the 20th century. Menuhin was first shown the manuscript of the concerto in the spring of 1951 in London by Albi Rosenthal, an amateur violinist and rare books dealer who had heard Menuhin in his first concert in Munich. He instantly found an interest in the concerto and bought the rights to it from members of the Mendelssohn family residing in Switzerland, which he held for the rest of his life. This was not the first time he resurrected a concerto, for as a teenager he had premiered the “lost” Robert Schumann Violin Concerto in the USA. Menuhin edited the concerto for performance and had it published by Peters Edition. On 4 February 1952, Menuhin introduced the concerto to a Carnegie Hall audience with a “string Band”, conducting the concerto from the violin. An orchestration of Giuseppe Tartini’s “Devil’s Trill Sonata” was also on the program. This was the first time Menuhin had directed an orchestra in New York City. Menuhin played the work often in recital, and made three recordings of it. Born in Craiova, Romania, Liviu Prunaru began his violin studies at the age of 6 with Professor Oprisan. His teachers: Mr.Berbec, Ms. Mihaela Mailat, Ms.Adriana Carpen and Ms.Cornelia Bonzetti, guided him through his early years. During this period he won seven national competitions and 1st prize at the International Kocian competition of Czechoslovakia. Then in 1990, Mr. Prunaru was invited by violinist and Maestro Alberto Lysy to study with him at the renowned Menuhin Academy of Gstaad, Switzerland, where he worked among great artists like Lord Yehudi Menuhin, Igor Oistrakh, Ruggiero Ricci, Nikita Magaloff, Jean- Pierre Rampal, Peter-Lukas Graf, and Pierre Amoyal. Mr. Prunaru completed his professional studies with Miss Dorothy DeLay in New York, where he also actively participated in Master Classes with Itzakh Perlman. The Swiss record company Claves released all three violin concertos by Saint-Saëns where violinist Liviu Prunaru is accompanied by the Ensemble Orchestral de Paris and the distinguished conductor Lawrence Foster. As a last addition to his discography 3 recordings came out in 2005, Beethoven’s Integral violin and piano Sonatas, with Dana Protopopescu as partner, Vivaldi’s Four Seasons with Virtuosy from Lviv, conductor Serhyi Burko and Dvořák’s violin concerto with David Angus, conductor and Symfonie Orkester of Flanders. He has won the top prizes and gained international recognition at the most prestigious International Violin Competitions in the world. Mr. Prunaru was the 1997 Gold Medallist of the Dong-A International Violin Competition in Korea, Silver Medallist of the 1998 Indianapolis International Violin Competition in the USA, Silver (2nd Grand Prize) Medallist at the 1993 Queen Elizabeth in Brussels, Gold Medallist at the 1991 Rodolfo Lipizer International Violin Competition in Italy, and Gold Medallist at the R. Molinari Violin Competition in Switzerland, among many others. Mr. Prunaru made his New York City debut with the Juilliard Symphony in Lincoln Center’s Alice Tully Hall after capturing the 1st grand prize in the Juilliard Mendelssohn Competition. Also in 1999, Mr. Prunaru won the 1st grand prize at the E. Nakamichi Wieniawski Violin Concerto Competition resulting in performances with the Aspen Young Artists Orchestra. Mr. Prunaru has been featured as a soloist with: Concertgebouw Amsterdam, the Royal Philharmonic Orchestra, the London Symphony Orchestra, Belgium National Orchestra, Westdeutsche Sinfonia, Athens Philharmonic Orchestra, Bari Symphony Orchestra, Bucharest Radio-Symphony Orchestra, Orchestra Mayo of Buenos Aires, Indianapolis Chamber Orchestra, the Meridian Symphony, Mississippi Symphony, the Juilliard Symphony, and the Puchon Philharmonic Orchestra in Korea among many others. Mr. Prunaru has collaborated with many renowned conductors including Lord Yehudi Menuhin, Fabio Luisi, Emmanuel Krivine, Arthur Arnold, Alexandru Lascae, Georges Octors, Dmitri Lyss, Alexander Dimitriev, Peter Oundjian, Yuri Simonov, Andrew Litton, Peter Braschkat, Cristian Mandeal, Lukas Vis, Horia Andreescu, Mario Benzecry, Park Eun Seong amongst many others. Mr. Prunaru performs frequently as a soloist and in recital in all major cities in the world. Mr. Prunaru has performed at many prestigious Festivals including Aspen (US), Menuhin (CH), Enescu (RO), Brussels, Buenos Aires, Wallonie, Flanders, Evian, Athens, Incontri in Terra di Siena, Ascoli, and Salzburg Festivals. Mr. Prunaru has recorded many CDs with Camerata Lysy, as well as his own debut CD featuring works by Strauss, Brahms, Gluck, de Falla, Saint-Saëns, and Sarasate with pianist Luc Devos, which is released by Pavane Records.